The Gospel Project for Kids: Older Kids Activity Pages engage older kids during class time and include one page per session filled with activities that reinforce learning. Purchase one per child. The Gospel Project for Kids is a Christ-centered Bible study resource that looks at the big picture of God's story - the story of redemption through Jesus Christ. Each week, kids of all ages will follow a chronological timeline of Bible events, all the while learning how each story points to the gospel of Jesus Christ. 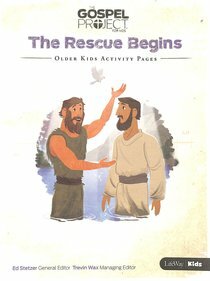 The Rescue Begins teaches kids about Jesus's early life and preparation for ministry. Sessions discuss His baptism, temptation in the wilderness, and personal encounters with ordinary people that changed their lives in extraordinary ways. Content also includes Jesus's crucifixion and resurrection, which made it possible for people to have a pure relationship with God. About "Gpfk 2015-18 #07: The Rescue Begins (Older Kids Activity Pages)"